Length, tensile strength, and bundle diameter - critical elements in determining the right tie for the application. Miniature cable ties offer the ideal solution for small, light duty cable and wire bundling applications up to 18 lbs. The one piece construction allows for consistent performance and reliability. A very low insertion force is required with the Miniature cable ties. Natural ties are preferred for indoor use applications while UV Black is recommended for outdoor applications, providing greater resistance to ultraviolet light. 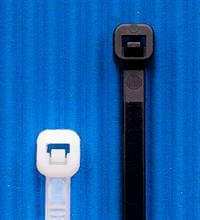 Cable Tie Express stocks the Miniature cable ties in a variety of lengths from 4”-15”. The Miniature 18 lb ties are available in both bulk 1000 piece bags and smaller 100 piece bags. A full range of standard and fluorescent colors of the Miniature ties are available. Tensile Strength – 18 lbs.